Couchbase Server saves data as items, each of which has a key and a value. Each item consists of a key and a value. Each key is unique within its bucket, and values can be either binary or JSON. Each value (binary or JSON) is identified by a unique key, defined by the user or application when the item is saved. The key is immutable: once the item is saved, the key cannot be changed. Note that Couchbase also refers to an item’s key as its id. Must be a UTF-8 string with no spaces. Special characters, such as (, %, /, ", and _, are acceptable. May be no longer than 250 bytes. Must be unique within its bucket. Binary: Any form of binary is acceptable. Note that a binary value cannot be parsed, indexed, or queried: it can only be retrieved by key. JSON: A JSON value, referred to as a document, can be parsed, indexed, and queried. Each document consists of one or more attributes, each of which has its own value. An attribute’s value can be a basic type, such as a number, string, or Boolean; or a complex, such as an embedded document or an array. a1 and a2 are attributes that respectively have a single number and a single string as their values. a3 is an attribute whose value is an embedded document consisting of a single attribute, b1, whose own value is an array of three numbers. a4 is an attribute whose value is an array of two documents, each document consisting an attribute (c1 or c2) whose own values are respectively a string and a number. Note that the official JSON definition is provided at RFC 7159, and at ECMA 404. The benefits offered to application-programmers by JSON are considered in The Couchbase Data Model. A sub-document is an inner component of a JSON document. The sub-document is referred to by a path, which specifies attributes and array-positions. a1, whose value is a number. a3.b1, whose value is an array of numbers. a3.b1, whose value is the first number in an array. a4.c2, whose value is a number. The Couchbase SDK provides a Sub-Document API, which allows paths to be specified, and sub-documents thereby read and written to. This makes it unnecessary to transfer entire documents over the network when only partial modifications are required, potentially providing significant improvements in network-performance. For further information, see Sub-Document Operations. meta: The attribute whose value is the standard metadata for the saved document, airport-1306. id: The key of the saved document, which is airport_1306. rev: The revision or sequence number. This value is for internal server-use only: it is used in the resolution of conflicts that occur when replicated documents are updated concurrently on different servers, representing the number of times the document has been mutated. For more information, see XDCR Conflict Resolution. expiration: The expiration-time (or Time-To-Live) of the document. If non-zero, this determines the point at which the document is removed from the system. The value can be set either per-document, by means of Couchbase SDK APIs (which is referred to as TTL); or per bucket, by means of Couchbase Web Console, the Couchbase CLI, or the Couchbase REST API (which is referred to as Bucket TTL). For information on TTL, see Core Operations. For information on Bucket TTL, see Bucket TTL. flags: Couchbase SDK-specific values that may be used to identify the type of data saved, or to specify formatting. type: The type of the saved value, which in this case is json. 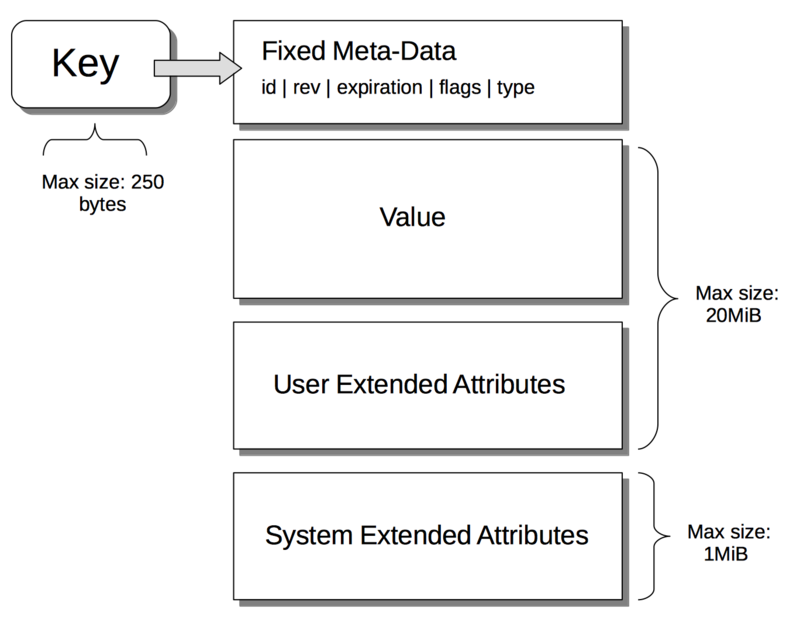 xattrs: Extended Attributes, which constitute a special kind of metadata, some of which is system-internal, some of which can optionally be written and read by user-applications. See Extended Attributes for more information. The following diagram indicates the respective maximum sizes of the components of a Couchbase Server data-item.